We have dedicated premises for primary food packaging producing facilities. 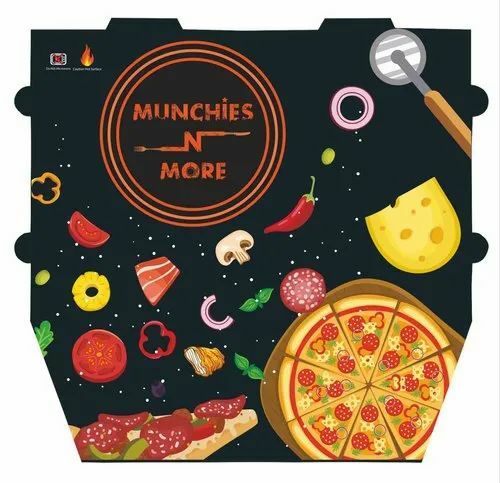 We manufacture and supply huge nos of superior-quality Corrugated Pizza Boxes. They are made from food grade paper and all other hygienic factors are taken care in its manufacturing. It is made attractive with high quality printing and graphics. They are used by pizza eateries and outlets for the purpose of packaging pizza for home deliveries or takeaways. They help in keeping the pizza warm and fresh till the time it gets delivered to the client's doorstep. They are sturdy and reliable. They prevent the food item from falling or getting damaged during transit. They are available in large, medium and small shapes with attractive graphics and company logos. They are delivered to clients within the specified time-frame at affordable rates. We are one of the major Pizza corrugated box manufacturers along with dealing and stockists for Kraft Paper and Duplex Paper Board. We are in the said field for the last three decades having head office at Goregaon and associated manufacturing units at Vasai, Boisar and Wada along with warehousing facilities at Goregaon and Vasai. Our superior-quality products are provided to the clients at affordable prices within the stipulated time-frame. Our range of products is available to clients in different shapes and sizes. They are used for storage as well as packaging purposes. These products enable in the safe and efficient storage of items so that no damage could be caused to them. They help the packaged items withstand the rigors of transit. Manufactured at our advanced infrastructure facility by using premium-quality machines, our products are available to clients after the approval of quality auditors within the time-frame specified by them. We are also members of reputed Industry Associations like Indian Institute of Packaging (IIP) and Western India Corrugated Box Manufacturers Association (WICMA) which helps us in various ways like training of personnel, testing of samples and other benefits.